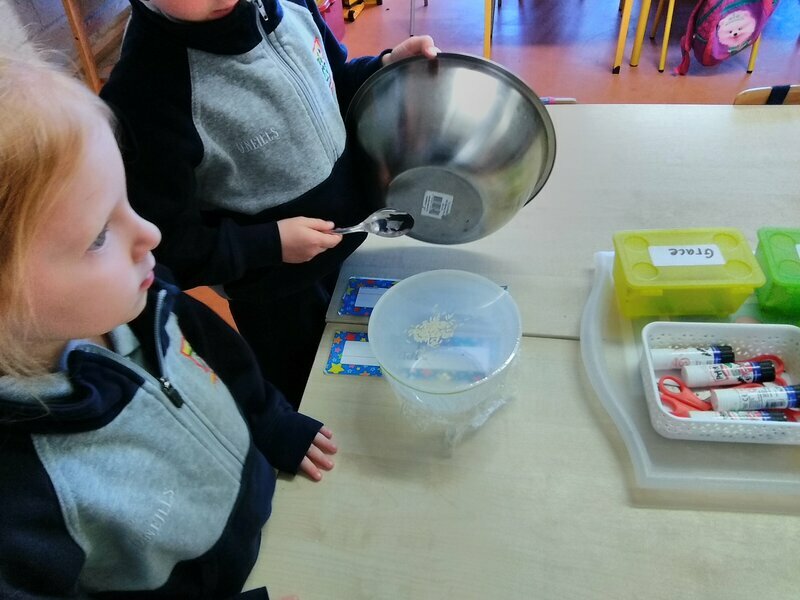 Ms Griffin’s junior infants were eager to study the life cycle of a frog after a visit to the pond where we were lucky enough to see heaps of real life frogspawn! 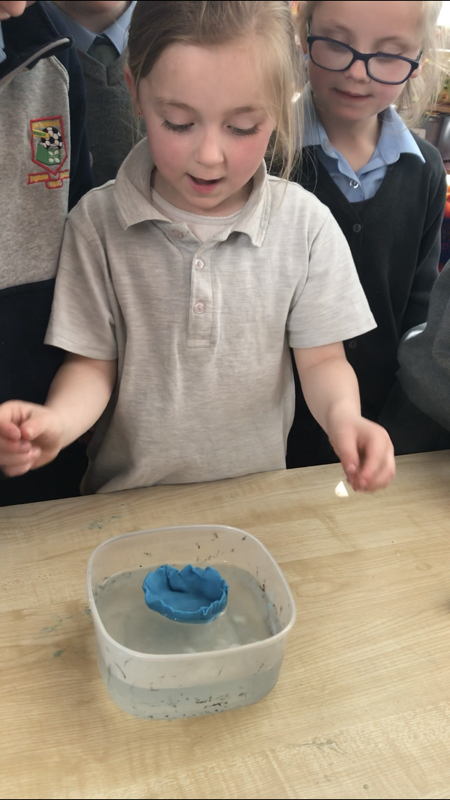 We didn’t just want to study the life cycle of the frog, we wanted to bring it to life by making a 3D model! We set about constructing our model out of recyclable materials by making frogspawn using cupcake cases and paint. Next, we made tadpoles using egg cartons and paint. After the tadpoles, we made froglets using egg cartons, glue and green paper. 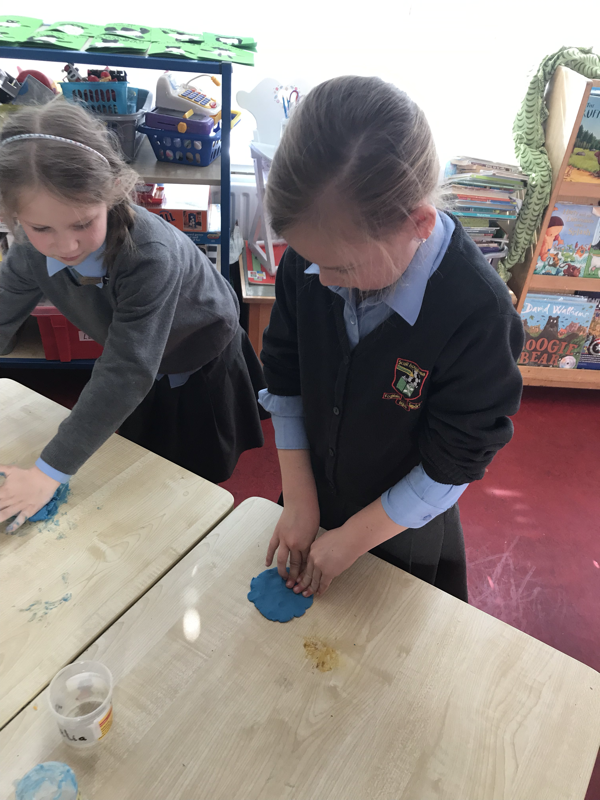 Finally we made our frogs using air dough, paint and green paper! We stuck the four stages onto card in the right order and then we labeled them. We loved the fact that this science project provided us with some art and literacy opportunities too! 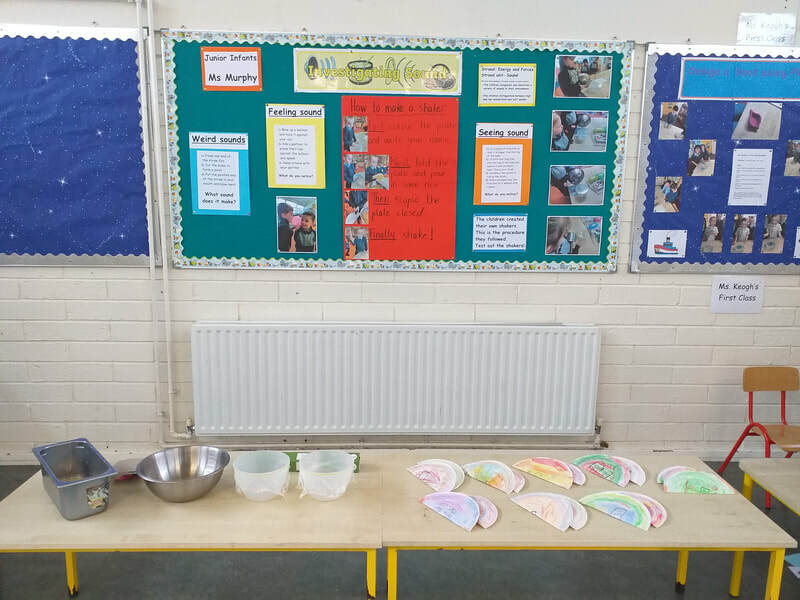 We had great fun at the science day explaining the life cycle of the frog to the visitors and then testing them using our life cycle of the frog puzzles! Take a look at some of the steps to creating our 3D models below. 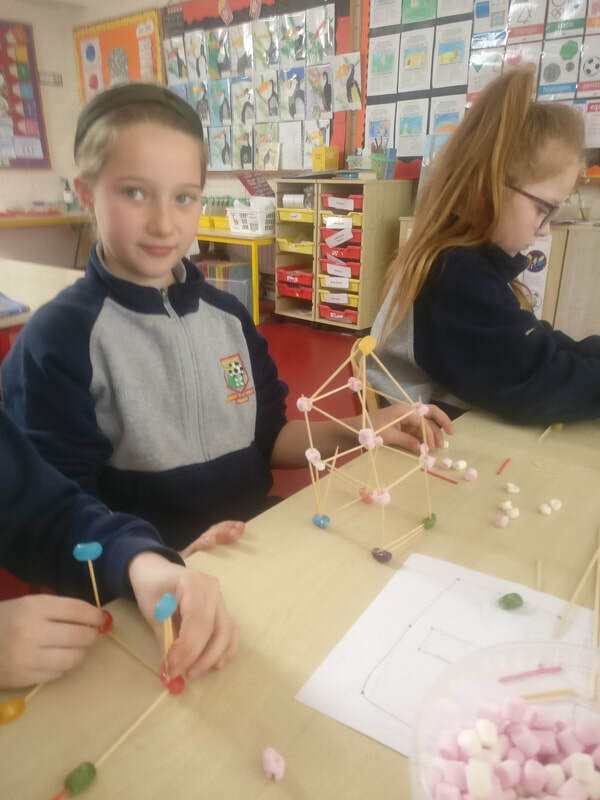 Candy Construction in Ms Smith's second class! Materials: cocktail sticks, bamboo skewers, jelly beans, marshmallows. Our Task: Explore what can be created and constructed with the above materials. Before delving in to the jelly beans and marshmallows, we made a plan. 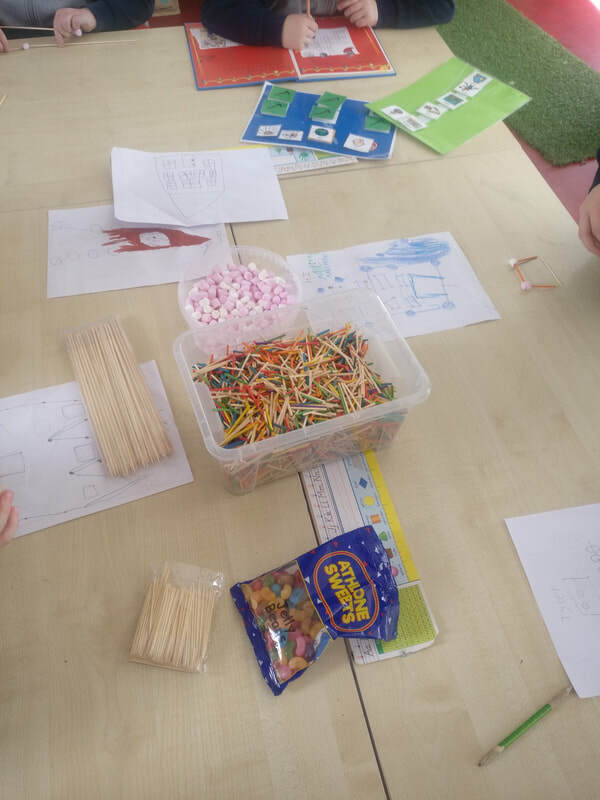 Each child thought about what they would like to try build and how they would go about it. 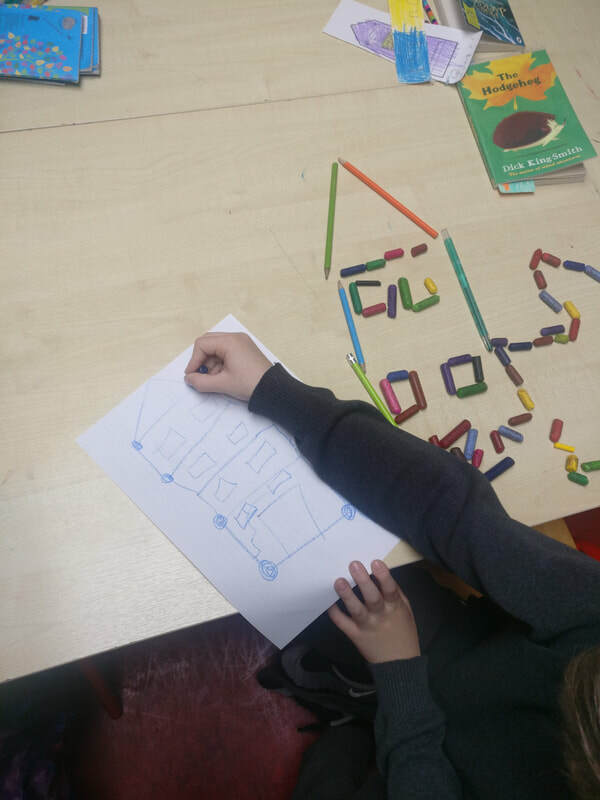 Some children took some crayons and pencils to help the visualise, others began drawing their ideas on to paper. With our plans in place, the next step was to begin experimenting. We gathered our materials (and resisted the temptation to eat everything). 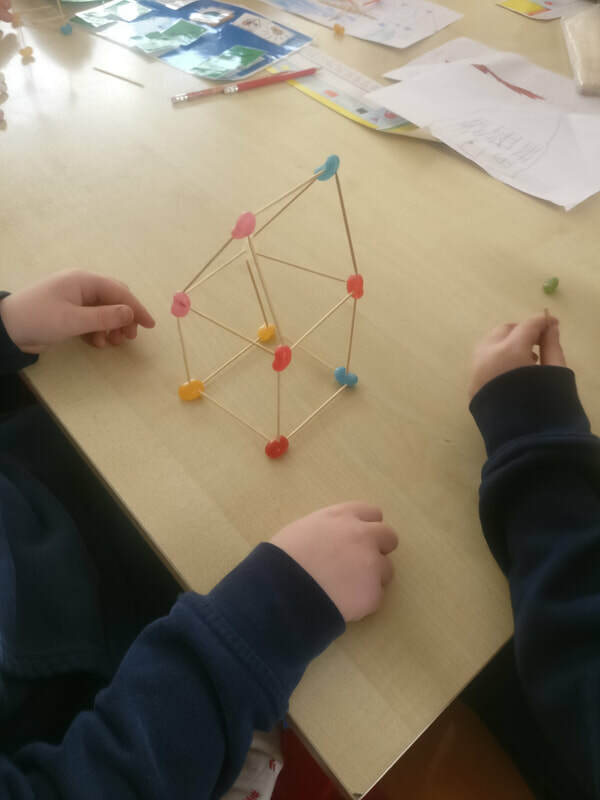 The children tried making constructions of all different shapes and sizes. We explored with 2D vs 3D shapes - what could we do to add extra support to the 3D shapes? We tried making tall shapes vs short shapes. 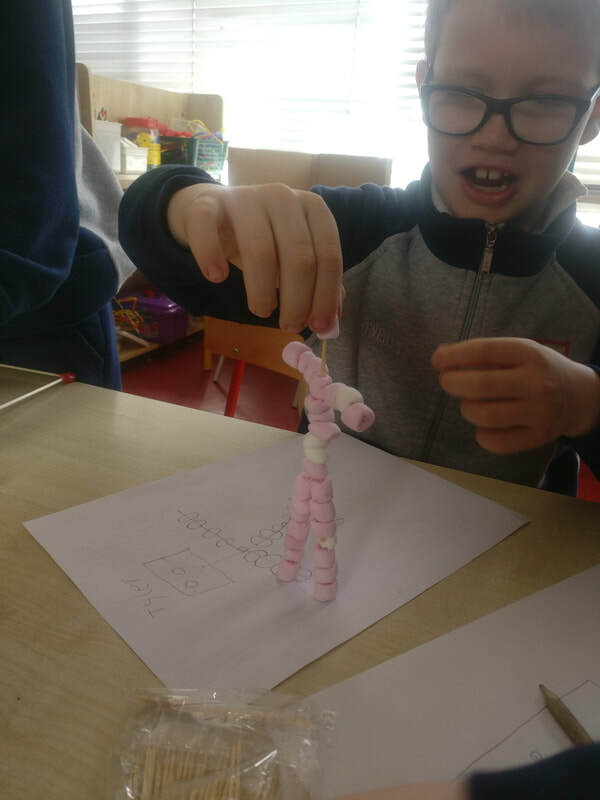 We compared the strength of the jelly beans vs the marshmallows at holding the sticks in place and we also compared the long bamboo skewers to the short cocktail sticks, in terms of which made a more secure structure. 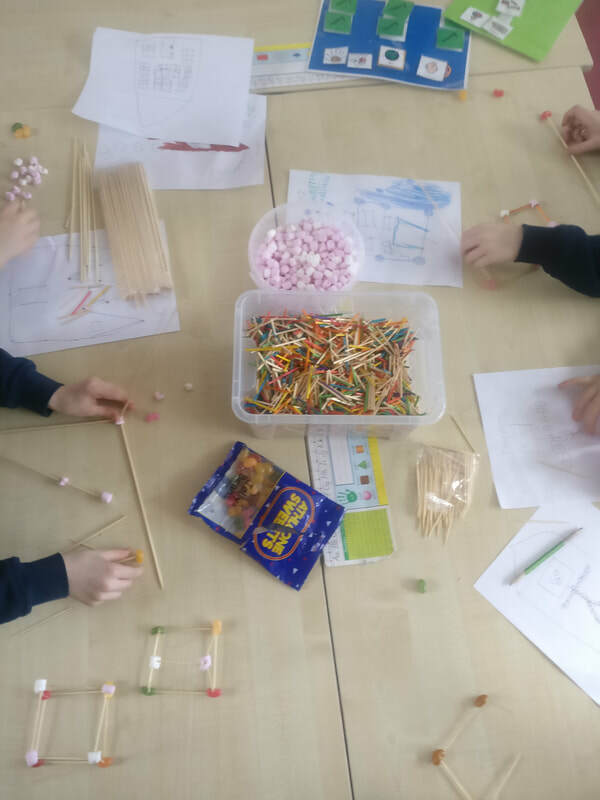 The jelly beans were much firmer than the marshmallows and held the sticks more securely in place. The long skewers appeared too heavy for the jelly beans or marshmallows to keep in place. 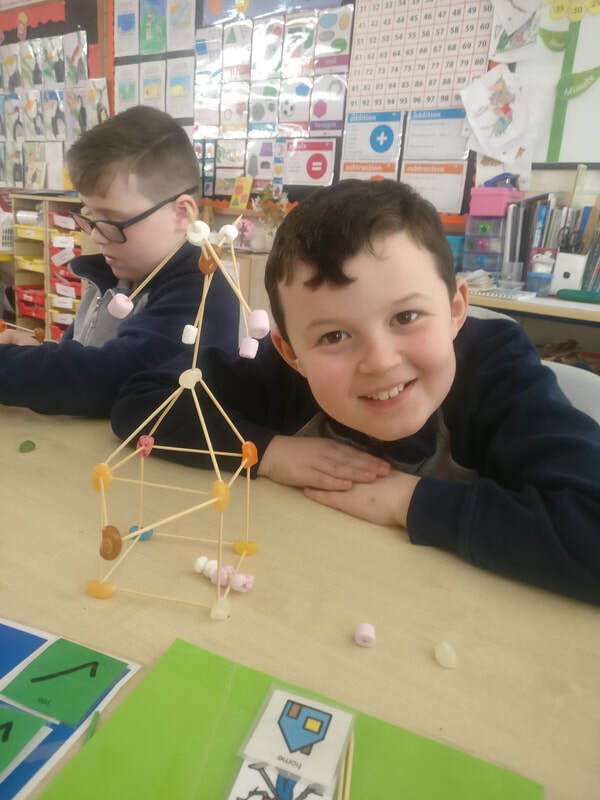 We found it hard to make tall constructions with the long skewers. 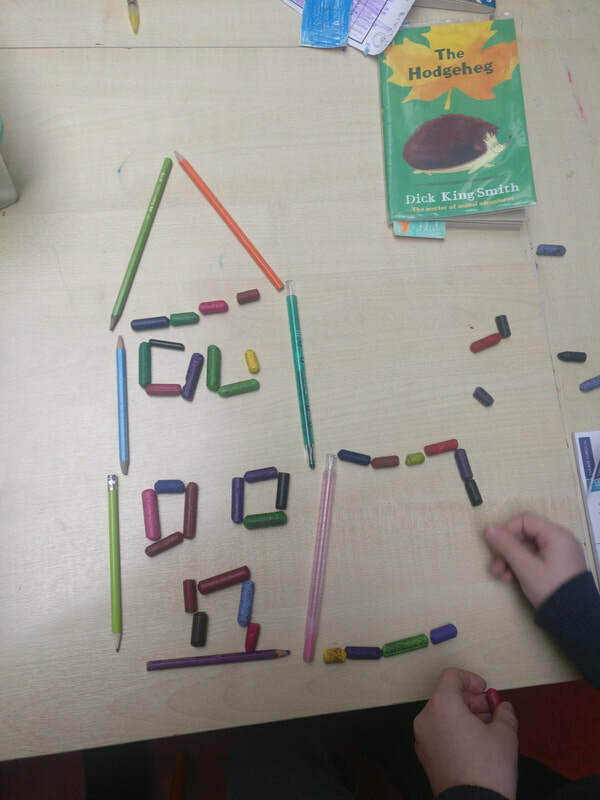 ​We discovered 3D shapes need lots of support and a good base to keep them upright. The children really enjoyed this challenge and did an excellent job explaining our findings and helping others on Science Day. Take a look at some of our constructions in the photos below. 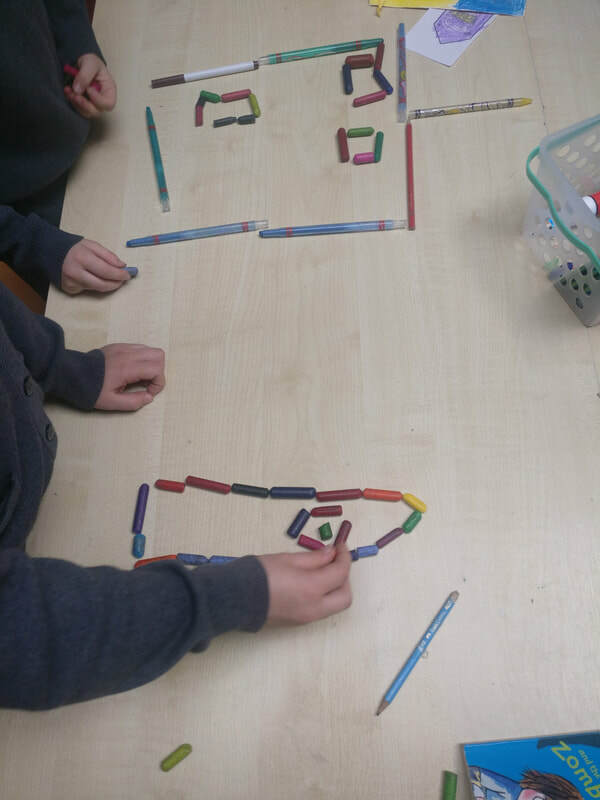 Spaghetti Bridges in Ms O’Shea’s Second Class! The brief we were given was to construct a free standing bridge out of spaghetti, strong enough to support a 1/2KG bag of sugar. We were only allowed to use spaghetti, elastic bands and tape. We found out that bracing strands together made them stronger. 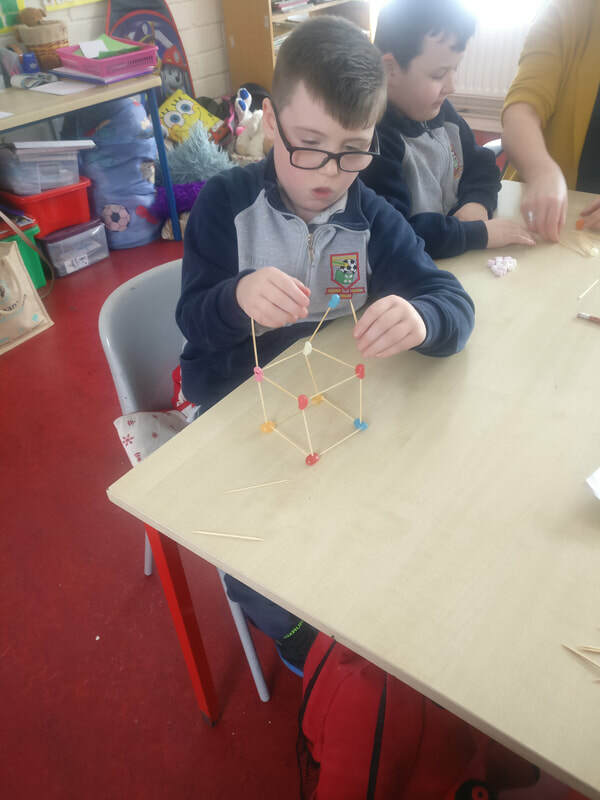 Some shapes are better at absorbing loads, we found out that triangles are particularly strong. We had great fun experimenting with the spaghetti and making our bridges. We tested the strength of our bridges by placing a 1/2 bag of sugar on them. We learned that bridges manage two important forces: compression and tension – pushing and pulling. Too much of either and they buckle or snap. The children did an excellent job explaining our STEM challenge on Science Day. 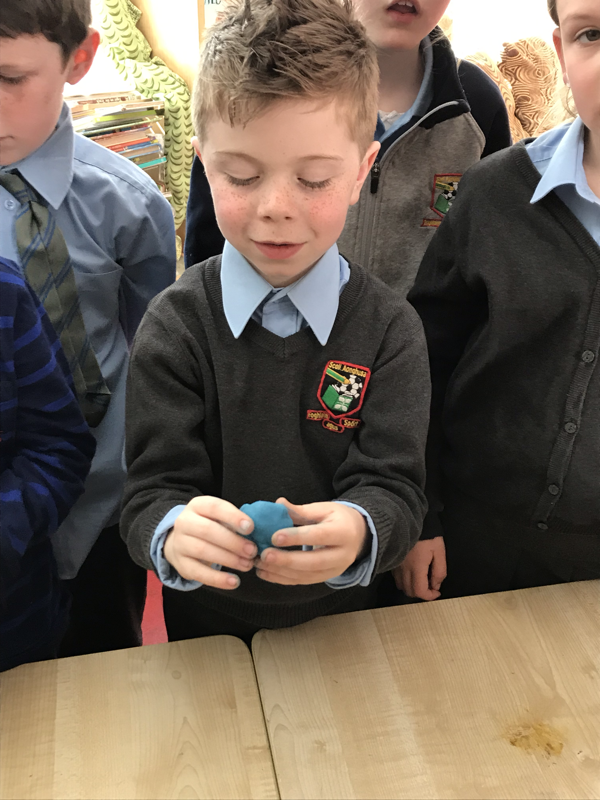 Take a look at our photos of our challenge and of the fun we had on Science Day. Materials: Paper, coins, books ( to make two banks for a river) and counting cubes. Our Task: To explore how different materials and shapes effect the strength of a bridge. Preparation: Prior to completing the experiment, we investigated images of many different types of bridges. 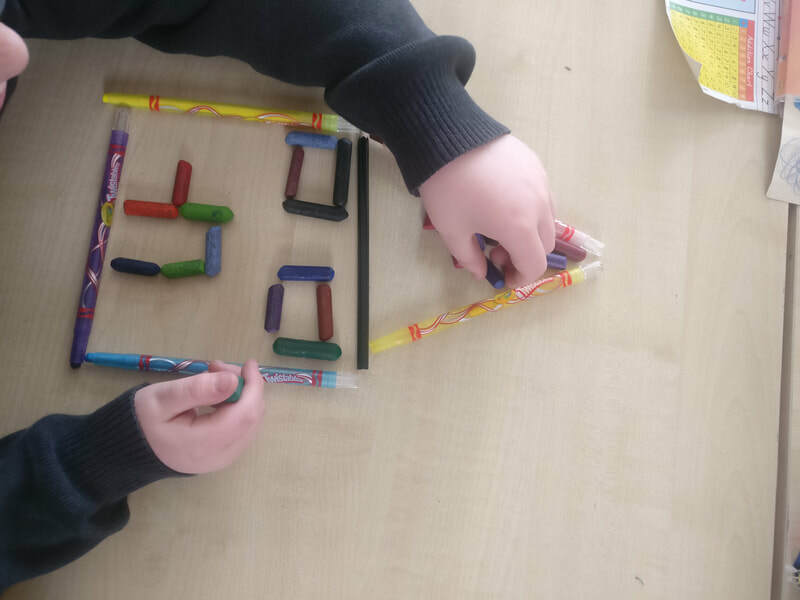 We looked at the materials used to make the bridges and the different shapes used in making the bridges. We discussed what we thought each part of the bridge was there for and what work it was doing. What is a bridge? Where would you find a bridge? What makes a good bridge? Who passes a bridge on their way to/from school? Experiment: We then began our experiment. We used our school books to make the banks of the river. 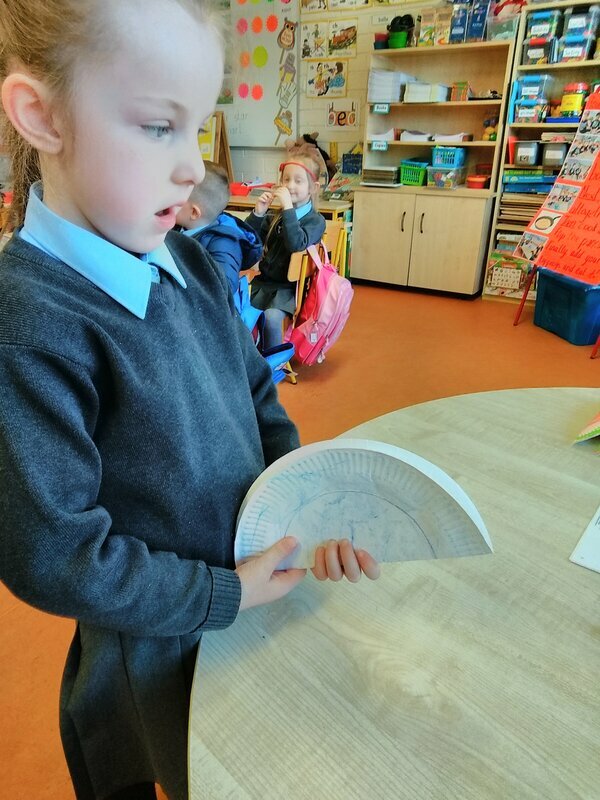 We used A4 paper to make the bridge to cross from one bank to the other. Cubes/counters were used to measure the strength of the bridge. The strength of each bridge was recorded by the children using their clipboards. We really felt like engineers. ​Have a look at some of the pictures of us carrying out our experiment. 5) Changing the bridges material from paper to cardboard made the bridge even stronger and able to carry over 100 counters. KEY FINDING: Changing a bridges shape and material used can increase its strength. 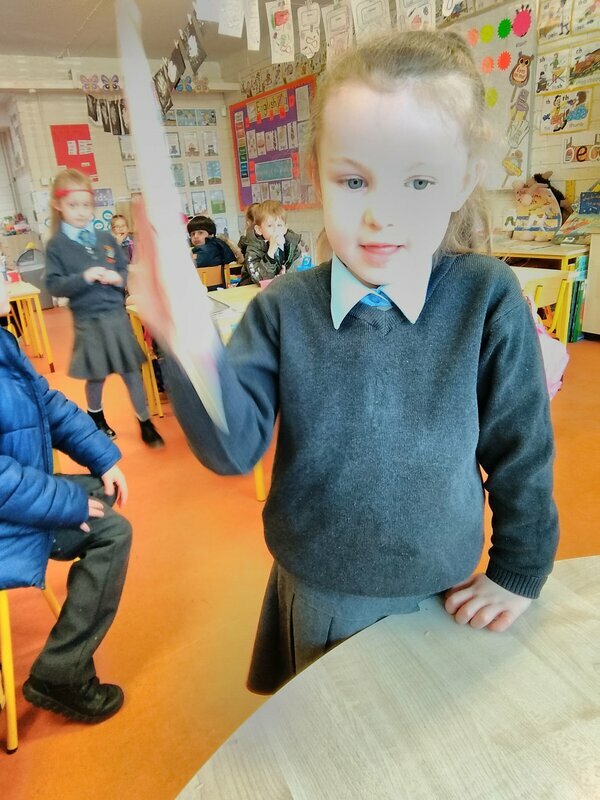 In Ms O’Dea’s Senior Infants we were exploring balance! We were learning about how weight has to evenly distributed to find the balance. We were making balancing clowns. First we coloured them, then we cut them and then we tried to balance the clowns on our finger. It would not work because all of the clown weighed the same. 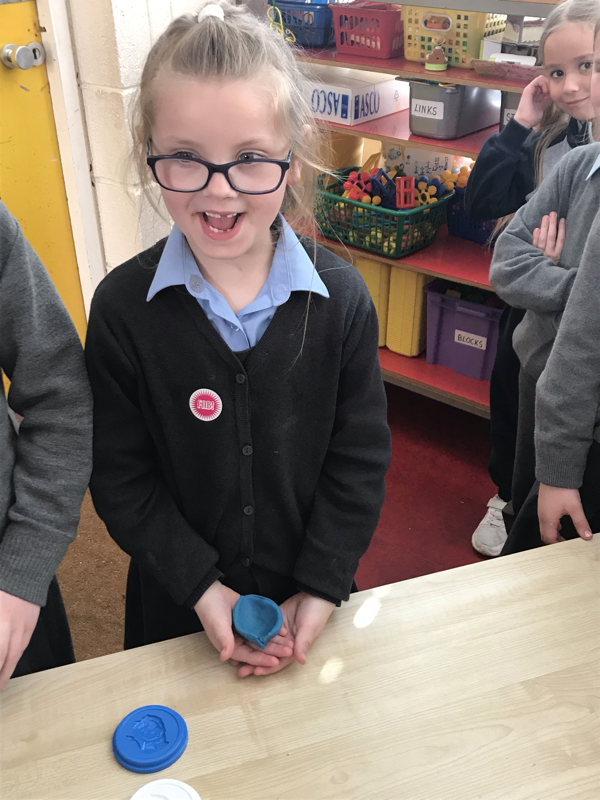 We then stuck two coins to the clowns hands which made the bottom heavier, and as if like magic the clowns balanced on the top of our fingers! 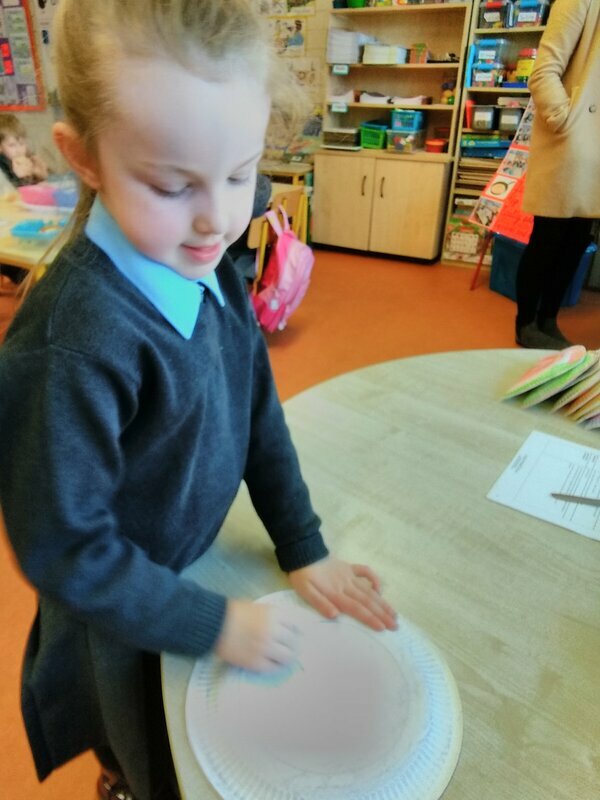 We have also been learning about balance in maths. 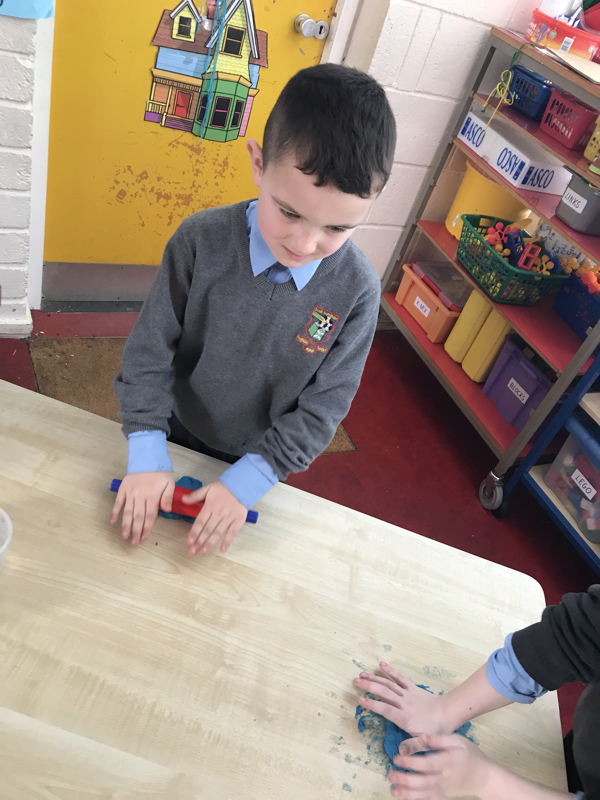 We have been balancing lots of different objects with cubes. ​Have a look at the pictures below to see us balancing our clowns and enjoying science day! spiral snakes and convection currents in ms martin's class! 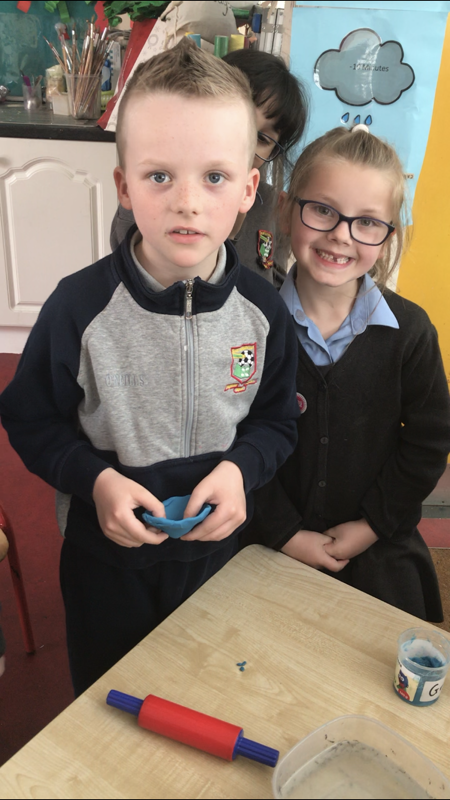 The children had a great day in school at our science day! Each class was given an experiment to test and ours was the effect of heat and how it creates convention currents. 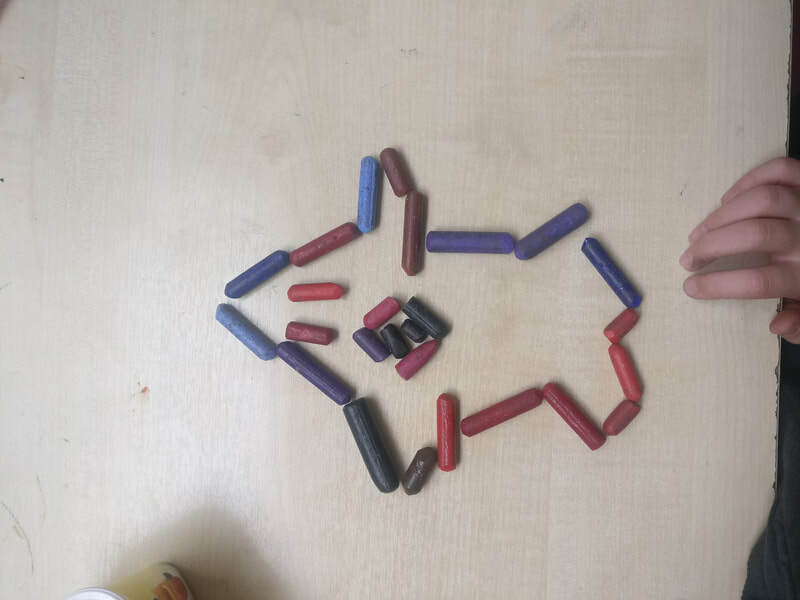  We made spiral snakes which when placed over a hot heat source, the hot air would rise making the snakes turn which would rotate them. The children tested this on a radiator which didn’t turn the snakes very well, but when we went into the staff room and tested it over the hob it turned very quickly. 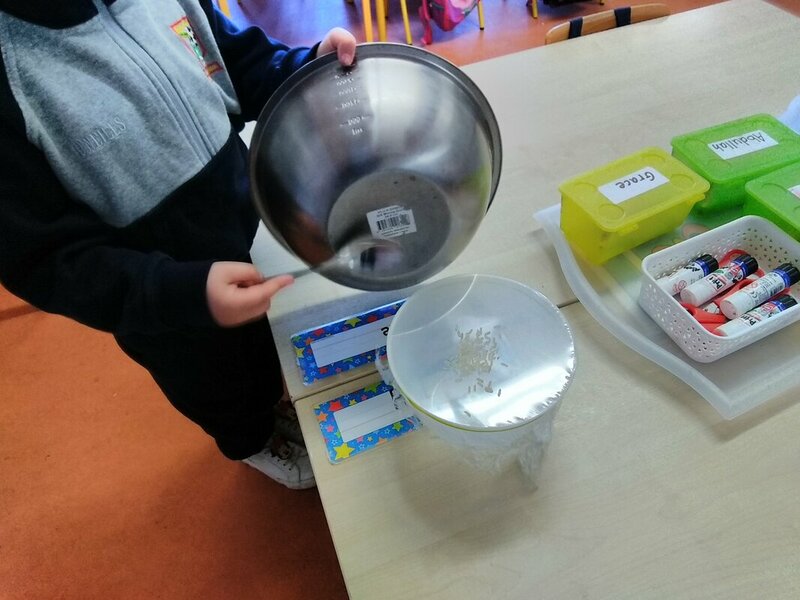 The senior infants enjoyed explaining this to everyone who came to our science day. 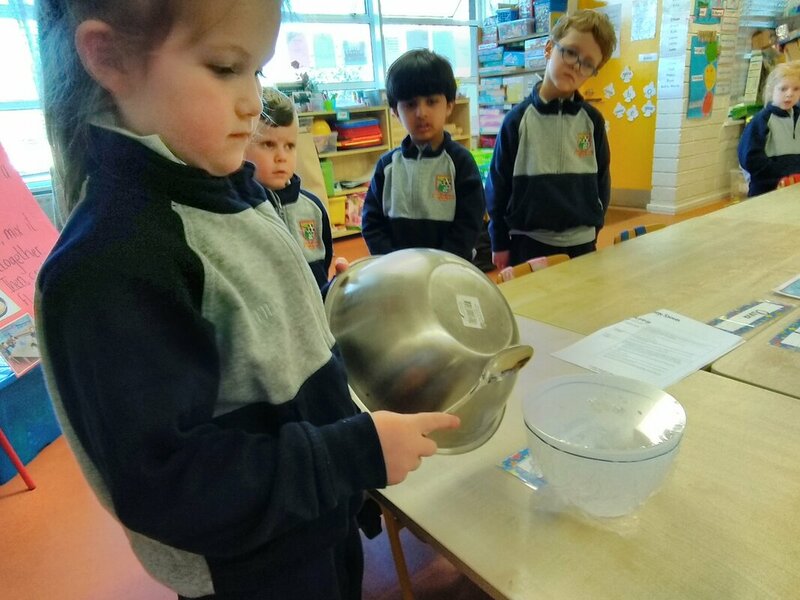 Science in Ms Kelly’s Senior Infant class! We explored gravity during Science week! 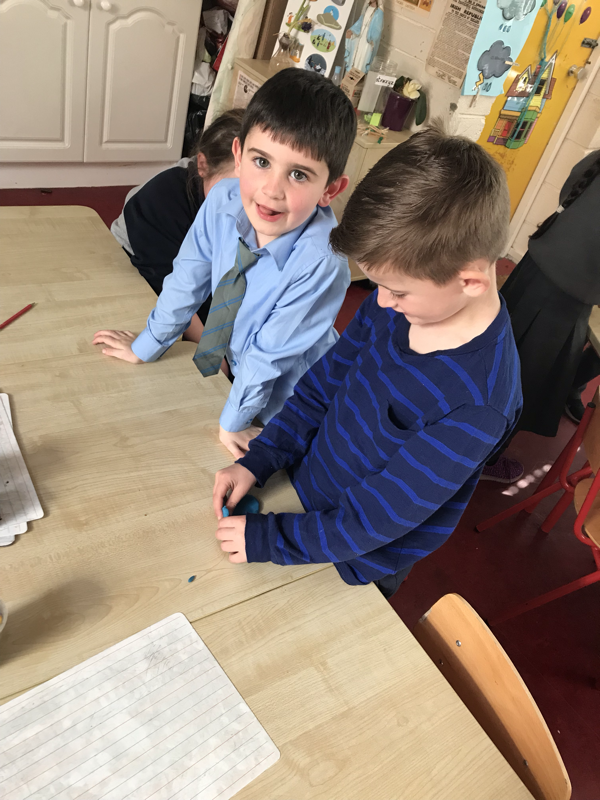 The boys and girls made paper helicopters and investigated different ways we could make our helicopter go faster or slower. We learned that lots of paper clips make it go faster. We learned that a smaller helicopter works better than a big one, but a tiny one doesn’t work at all! We learned that shorter propellers work better than longer ones! At the end of our investigation we held a race. Each team designed a helicopter and Robyn’s team won! Their helicopter was small, had short propellers and lots of paper clips! It went very fast! The boys and girls did did a great job explaining everything to our visitors! 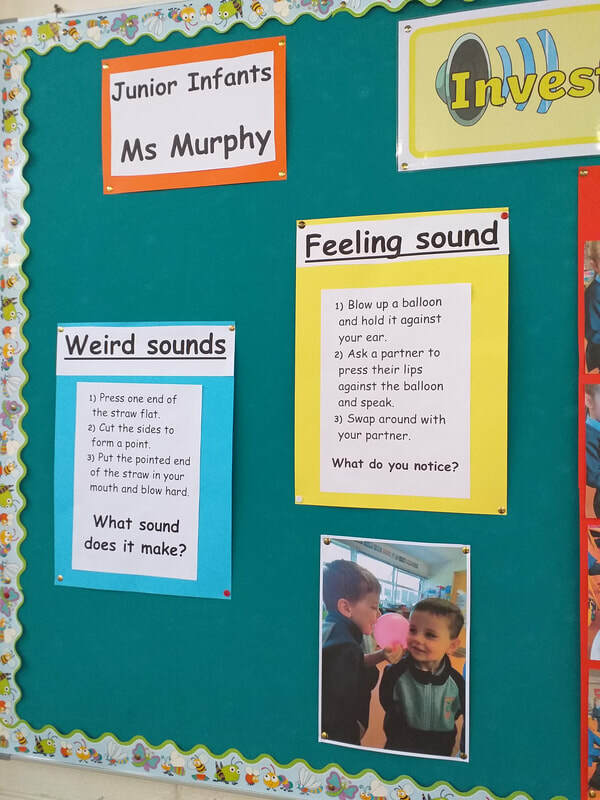 We The children had lots of fun learning about strange sounds during Science Week! They also really enjoyed showcasing all their new learning at our Science Day. 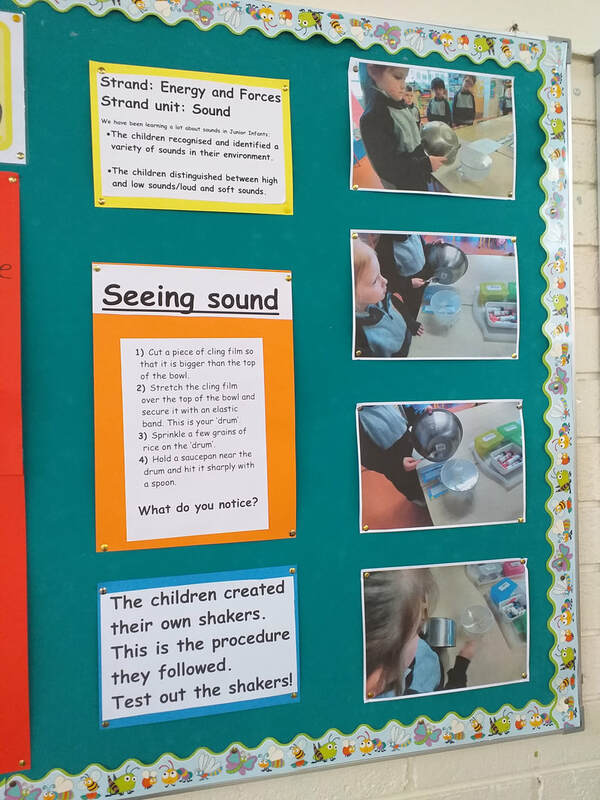 The children learned that sound is caused by vibrations which travel through the air. These vibrations can be made by blowing and banging. 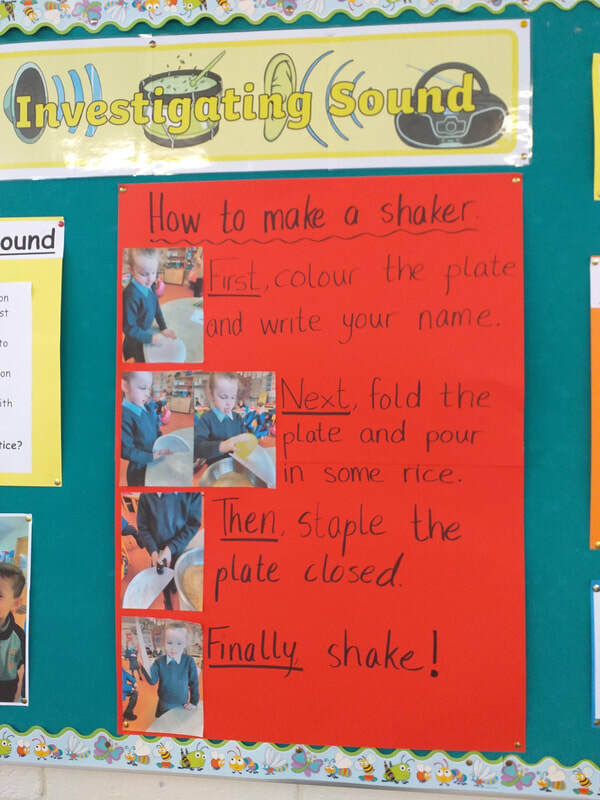 The children carried out three investigations in order to see and feel sound, as well as making weird sounds. 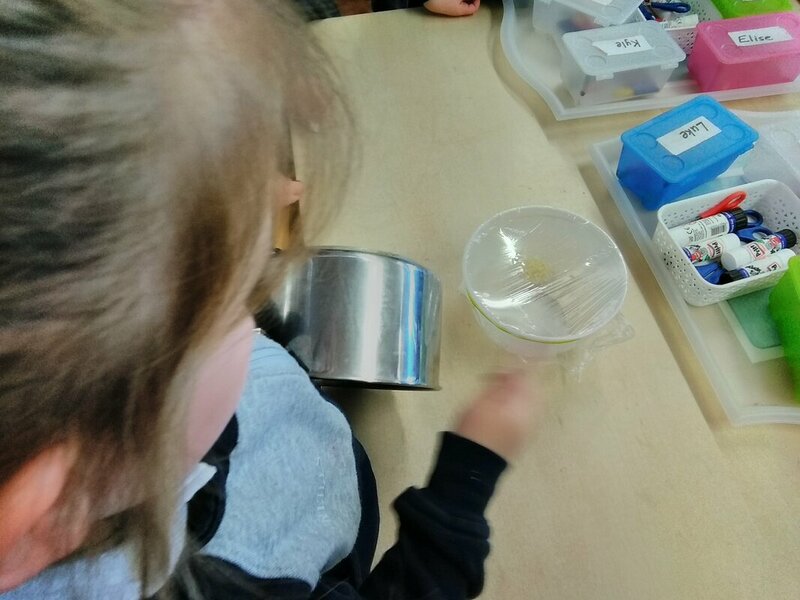 The children secured a piece of cling film over the top of a bowl using an elastic band. They sprinkled rice on top of the cling film and hit a saucepan sharply with a spoon which was close to the bowl, but not touching it. 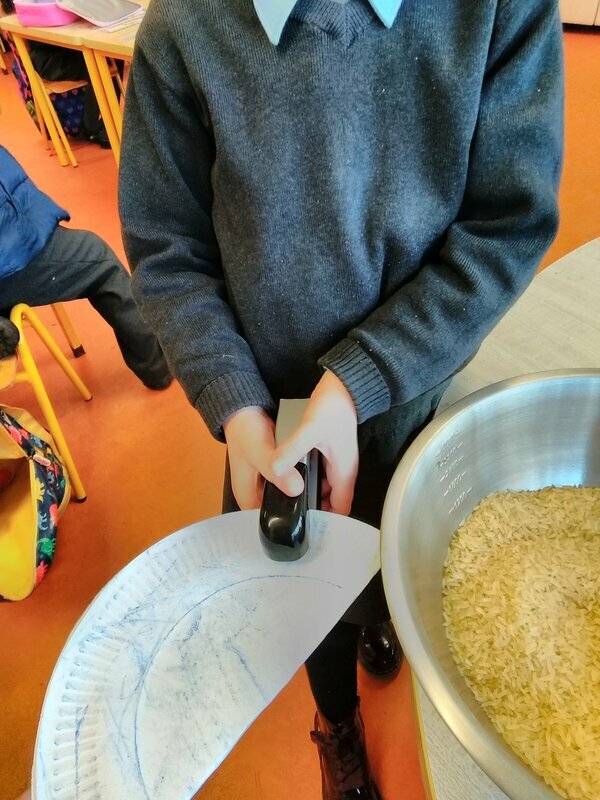 The children observed the grains of rice moving - these movements were caused by vibrations from the banging. The children held a blown up balloon to their ear. 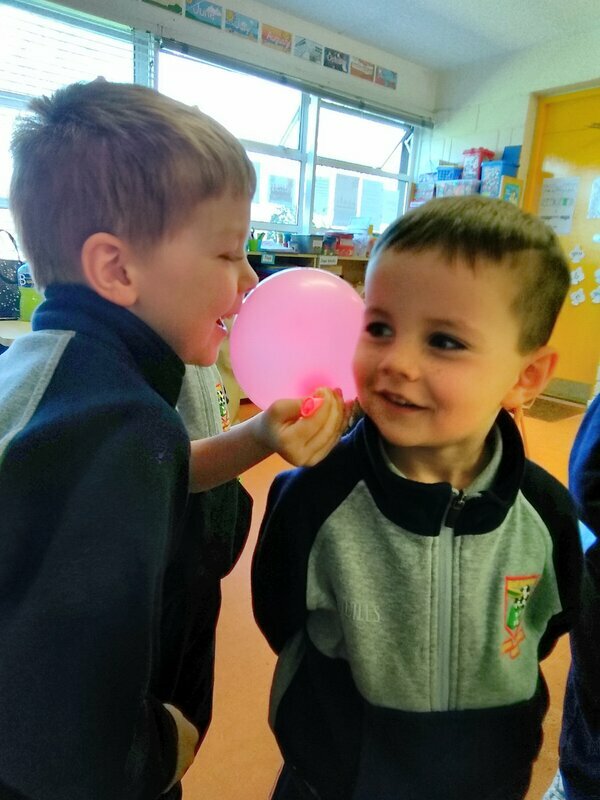 A partner pressed their lips against the balloon and spoke. The children could feel the vibrations through the balloon. We found this experiment a bit tricky at the start! The children pressed one side of the straw flat and cut this side of the straw into a point. The children put the pointed end into the side of their mouths and blew really hard. The weird sounds were made by the vibrations from the children's blowing. 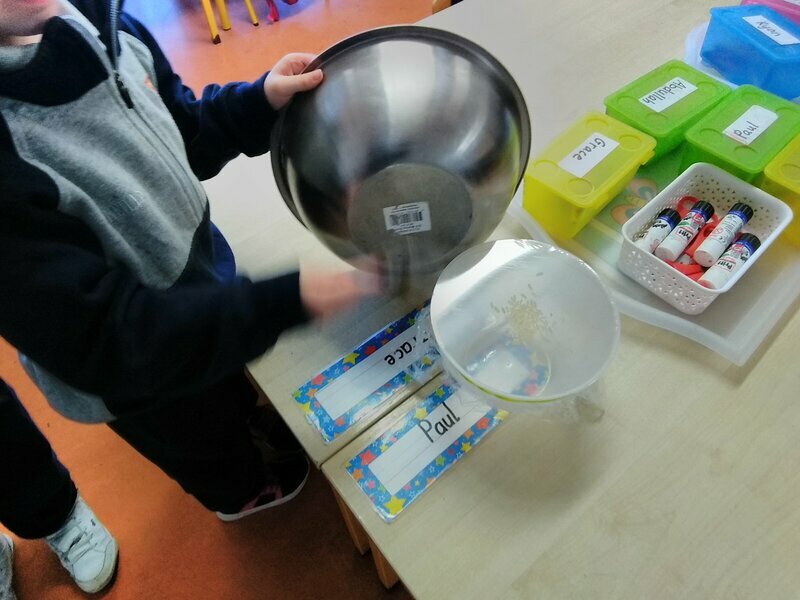 As the children were learning lots about sound during Science Week, we thought it would be lots of fun to make our own shakers to make our own sounds. 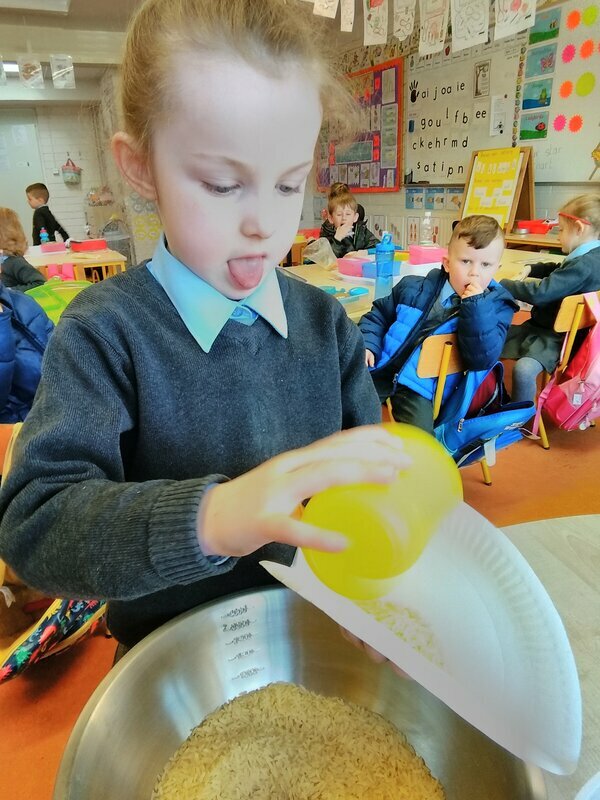 The children made shakers using paper plates and rice. 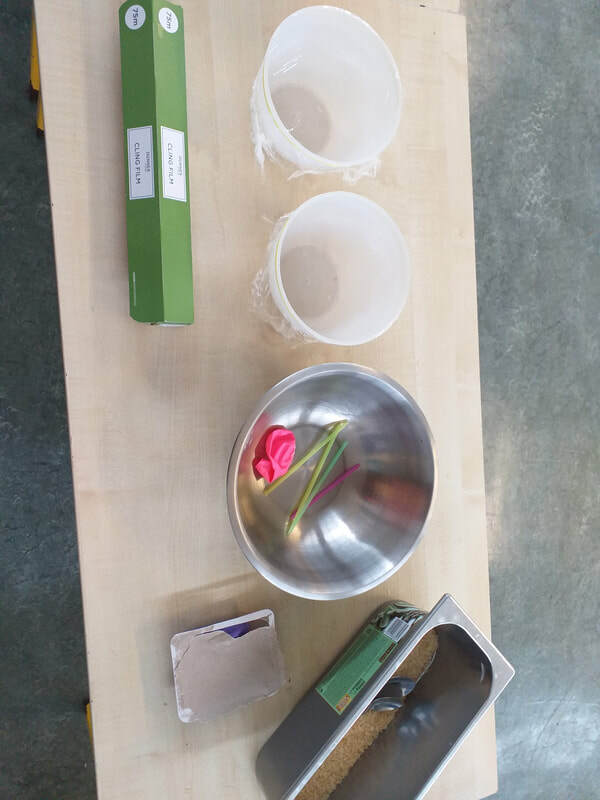 The children discussed the procedure involved in making a shaker and we made note of this. 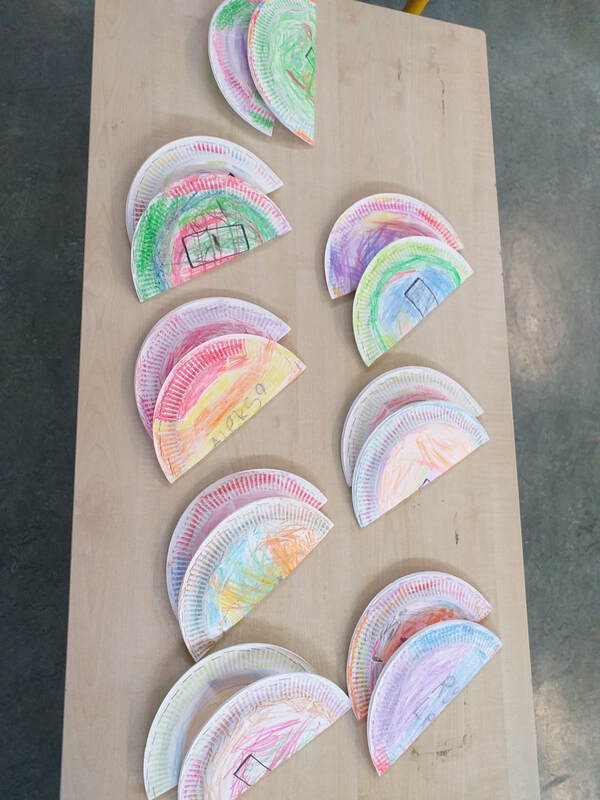 The children decorated a paper plate and folded it in half. The children poured in some rice and it was stapled closed. The children really enjoyed shaking the shakers, just to make sure they worked afterwards! Mixing Materials in Ms Smith's First Class!!! We decided to make lava lamps to investigate how materials may be changed by mixing. In preparation for making our lava lamps, we wanted to figure out how the different materials would act in relation to one another, so we set up 5 actitivies to explore and test these various reactions. ​We first predicted what we thought might happen before we did each of these activities. We put some water into a clear jar. Then added an effervescent tablet. (After this, we did the previous two activities, but instead of using water we used oil). We put a little oil into a clear jar and added an effervescent tablet. We put a little oil into a clear jar. Then added a few drops of food colouring. We put some water in a jar and added a little oil. We used our senses to watch and listen to what was happening in each of the jars during these 5 activities and we made some fantastic observations! In water, the effervescent tablet dissolved with a fizzing sound. In oil, nothing happened when the effervescent tablet was added. 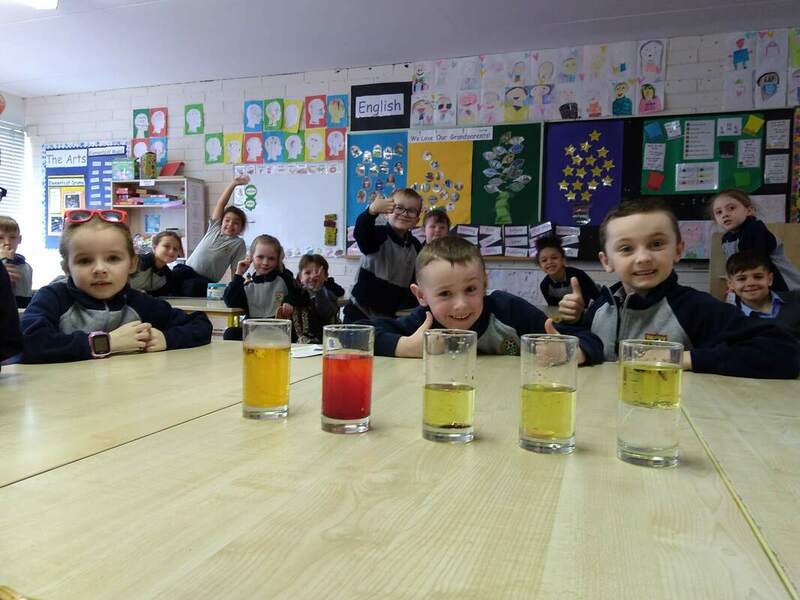 In water, the food colouring caused the water to become coloured. In oil, the food colouring did not dissolve. It stayed in little ‘blobs’. When water was added to oil, the oil stayed on top because it is lighter than water. 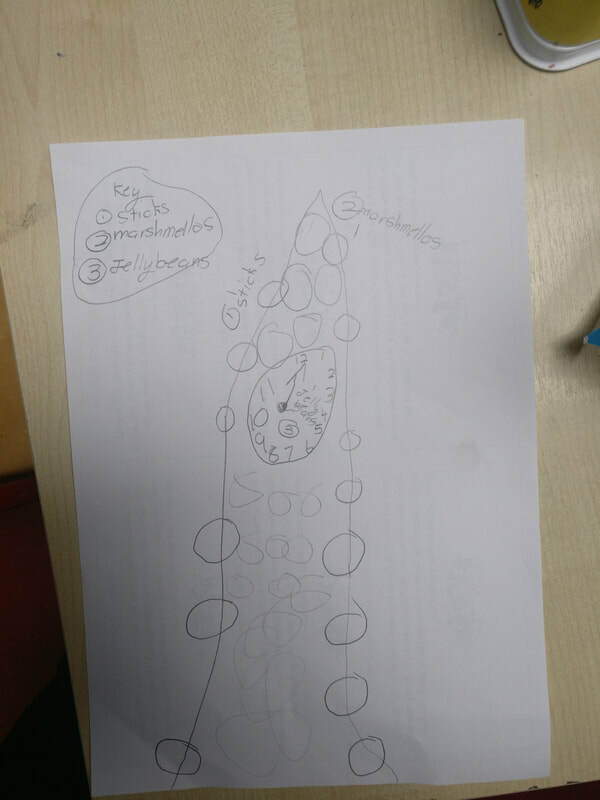 With these conclusions in mind we decided to make our lava lamps. We put water in a bottle. Next we added vegetable oil. After this we added about 10 or 12 drops of food colouring to the bottle. Finally we broke an effervescent tablet into 3 or 4 pieces and dropped them into the bottle. Oil is lighter than water so it sits on top of water when it is added. 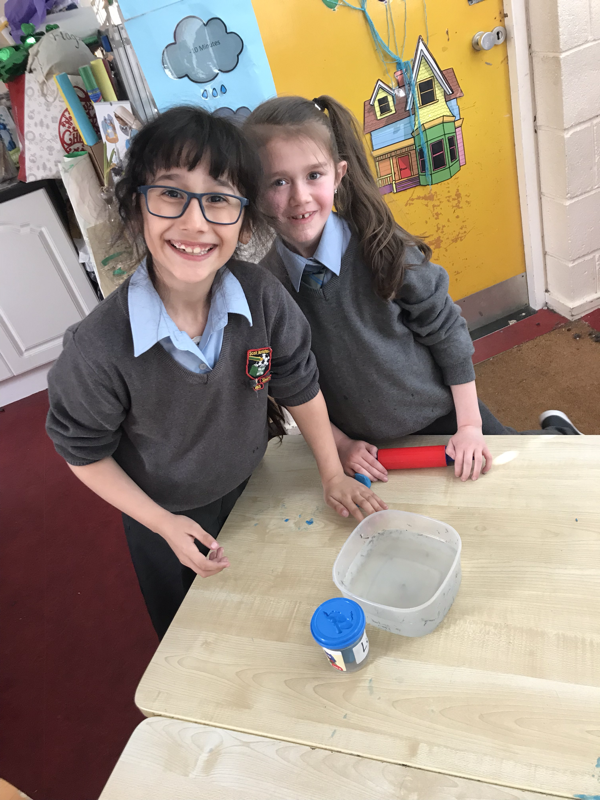 The food colouring does not dissolve in oil and is heavier than oil, so it falls through the oil down to the water and mixes with the water. When you drop the effervescent tablet into the oil and water, it falls down through the oil (it does not dissolve in the oil) to the bottom, where it reacts with the water (a chemical reaction) to produce carbon dioxide gas. 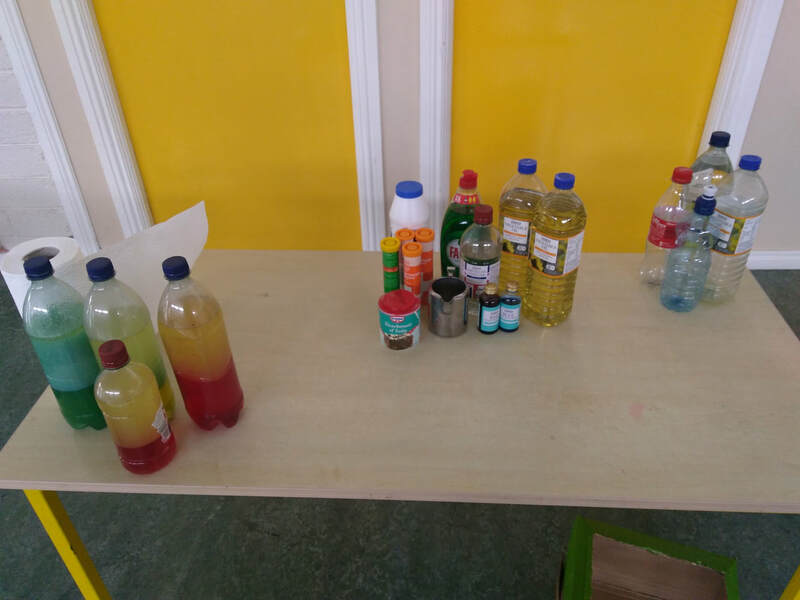 These bubbles of gas rise through the oil to the top of the bottle because they are light, taking some coloured water with them. The bubbles of gas burst when they reach the top, the gas escapes, and the drops of coloured water sink back down through the oil. another bit of the tablet, which will produce more carbon dioxide gas. 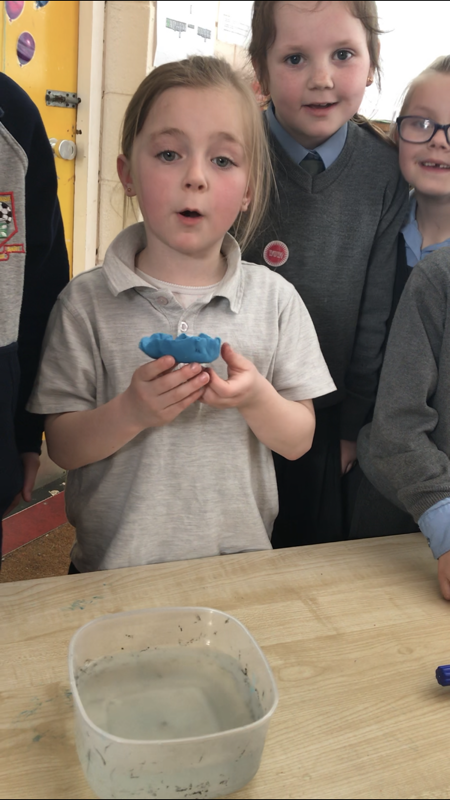 ​……With all the excitement of watching the chemical reactions when doing our lava lamp experiment, we decided to make some frothing reactions using vinegear and baking soda…..Check out our eruption!!!!! 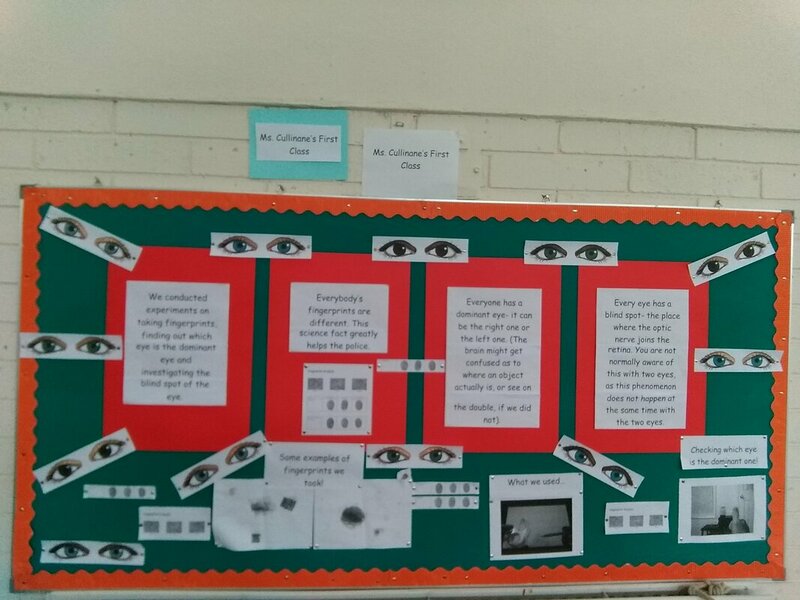 We conducted experiments on taking fingerprints, finding out which eye is the dominant eye and investigating the blind spot of the eye. We learned that everybody’s fingerprints are unique. 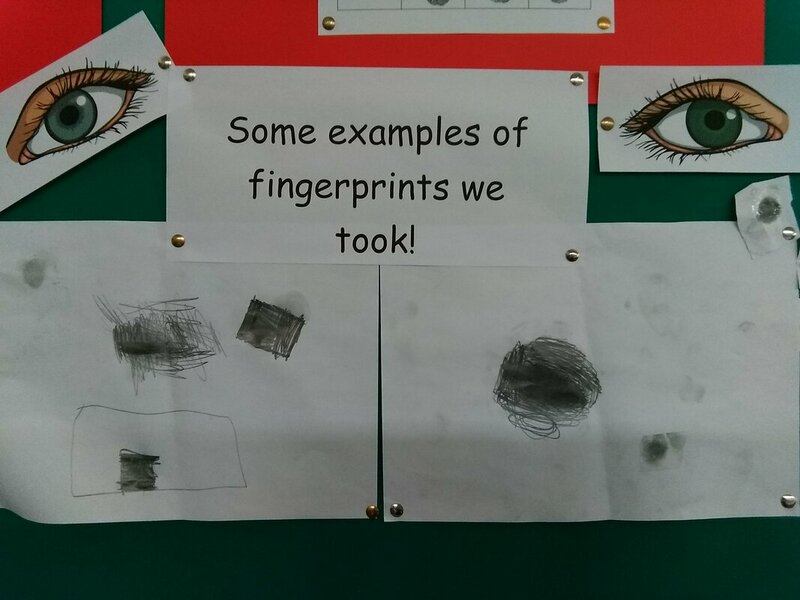 We had lots of fun taking our own fingerprints. We rubbed some lead from our pencils onto a white page. We rubbed our fingers into the lead and then pressed our fingers onto the sticky side of a piece of sellotape. We then stuck the pieces of sellotape onto a white page and we could then see our fingerprints! We learned that everyone has a dominant eye- it can be the right one or the left one. To find this, we picked out a vertical line in an object- for example the edge of a door. 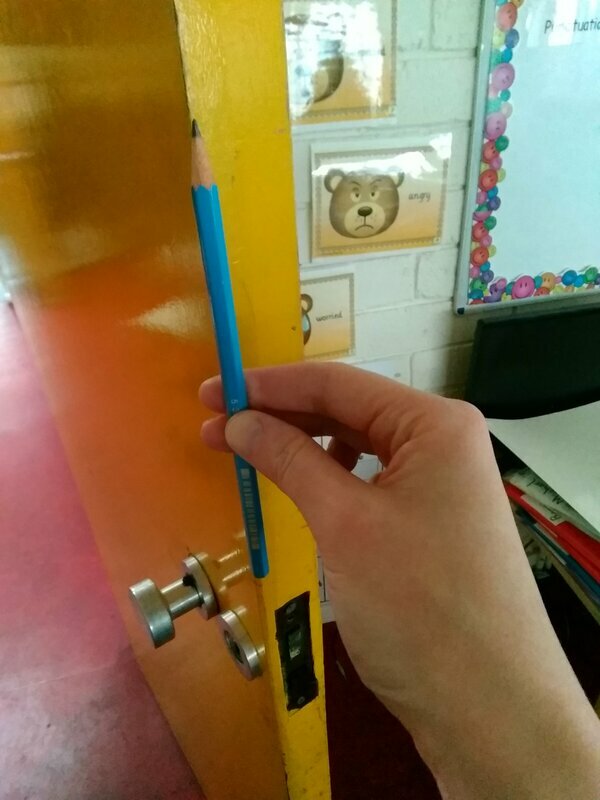 We each used a pencil and held it vertically in front of us and lined it up with the vertical line of the door. We each closed each eye in turn. We found that the eye which sees the pencil in the same place as when our two eyes are open is the dominant one. We learned that every eye has a blind spot. We each held a page with a cross and a spot at arm’s length with the cross on the right. We each closed out right eye. While looking only at the cross, we each brought the page slowly towards our face. 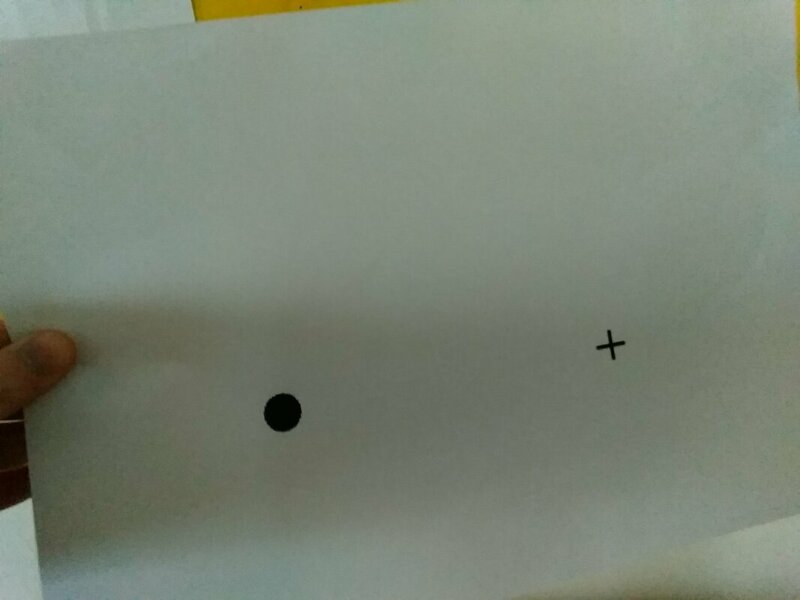 We found that at a certain point, the image of the spot disappeared because the light from it is falling on the blind spot of the left eye.